Straight Line Roofing & Siding is a locally owned and operated residential roofing and remodeling company located in Lewiston, Maine. Our service area includes Central & Southern Maine and its surrounding counties, including but not limited to: Androscoggin County, Portland, Augusta, Harpswell, Brunswick & Bath. We are committed to complete customer satisfaction. Our reputation for fair pricing, quality workmanship, and dedication to customer service has made us a preferred home remodeling business in our community. Second generation carpenters with over 50 years of combined experience. 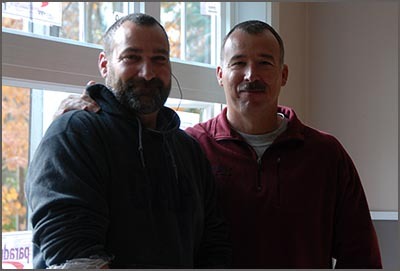 Let brothers Glen & Ernie make your remodeling dreams come true! We excel at remodeling and room additions, as well as outdoor living spaces. We also install vinyl windows, decks, custom trim work, gutters, and, of course, roofing and siding. We use only top quality products from industry leaders like CertainTeed, Azek & Mastic, and back them up with expert knowledge and experience. We are licensed, bonded and insured. Ask for a free estimate and the best warranty in the business. Also, ask us how we can help reduce your energy bill. Contact us to discuss your roofing and home improvement needs. "I treat all my customers like family, because we live in the same community together and I always want to be able to stop by and say hello, years after the sale."